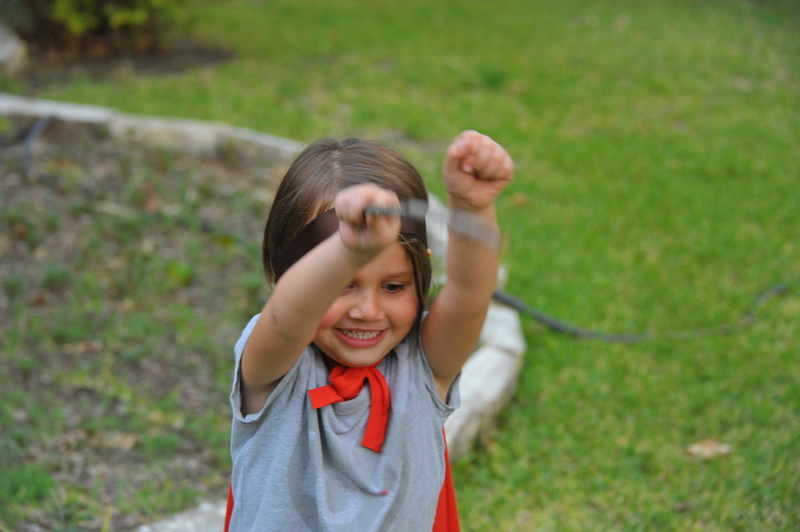 For Halloween I made a She-Ra costume for Lola. Among many accessories, it included a cape. The process of making the cape involved a red t-shirt, lots of cutting, no sewing, which surprisingly resulted in a super easy cape. Of course as soon as I finished “making” it, I wanted her to try it on. You can’t try on a cape without pretending to fly, and you can’t pretend to fly without taking pictures. So we went out in the front yard and worked on our flying skills. As you can see from below, proper arm positioning is crucial. As is carrying a stick. Something to do with wind shear, I think. A couple of days later, it occurred to her to wear her bathing suit and faux uggs. Naturally those go together. In all fairness to her, we were headed to swim class. So of course I had to take a picture. OOOh, let’s take pictures of your awesome outfit. I know. I’m just further encouraging this behavior. Of course, I never expected her to say, WAIT mommy! I need my cape! 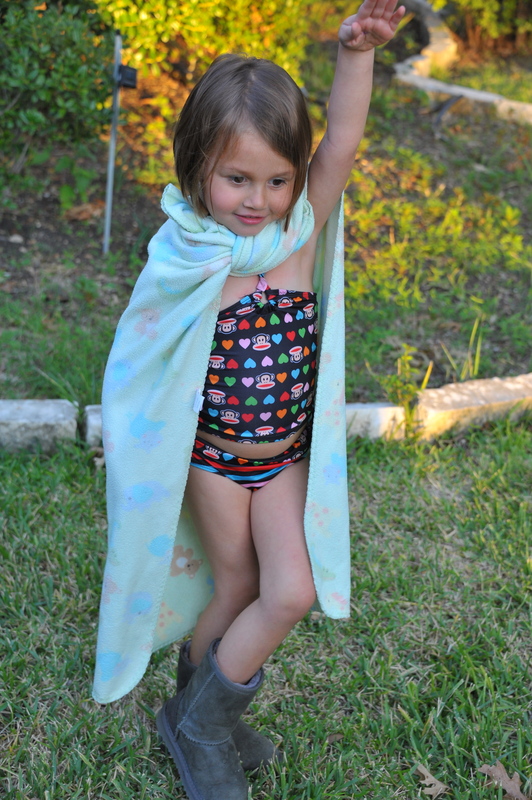 I’m not sure where She-Ra’s cape had gone off to, but improvisation is a kid’s middle name. Who needs Paris, New York or Milan? We tread new fashion ground right here in our front yard. Notice the positioning of the arm is again quite crucial. This entry was posted in Parenting: AKA - I Don't Know Any More Than You Do, Personal Style and tagged new fashion, She-Ra. Bookmark the permalink.